Service – Severely lacking. There was only one host/waitress combo, so she too, was super busy, which meant we were constantly in wait mode. Though perfectly nice, she was almost always running, and clearly frazzled. Atmosphere – Terrible. If you’ve been reading my posts, you’ll know that I love hole-in-the-wall types, not a big fan of super swanky types, and practically allergic to super “sterile” types. I wouldn’t classify Inase a hole-in-the-wall-type, it’s more a dingy-cafeteria-type. Sounds bad? It is! If I attempt to describe it, it’ll sound like a hole-in-the-wall, it’s a dimly lit, not particularly clean, chairs and tables are the epitome of minimalistic, just a tiny step up from folding chairs, but still left me feeling like I’m in a grade school cafeteria. It’s missing something… What is it missing… Swagger! The element of “cool”. The lack of music/tunes? The absence of any identity. Pop-up shops/restaurants put in more effort! Bottom line, not an inviting space. We were uncomfortable. 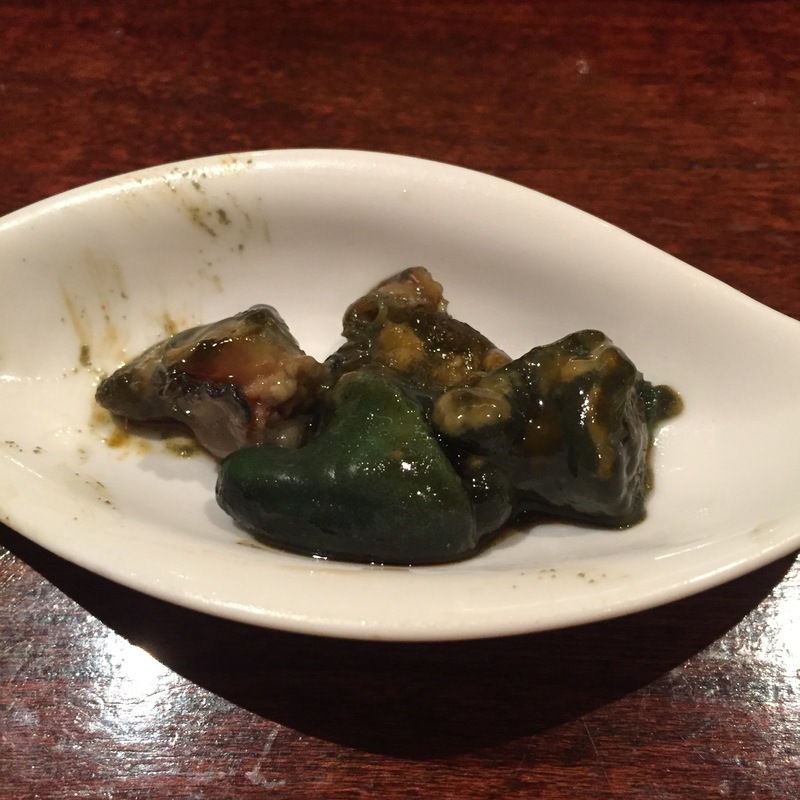 Food – This is the crazy part! 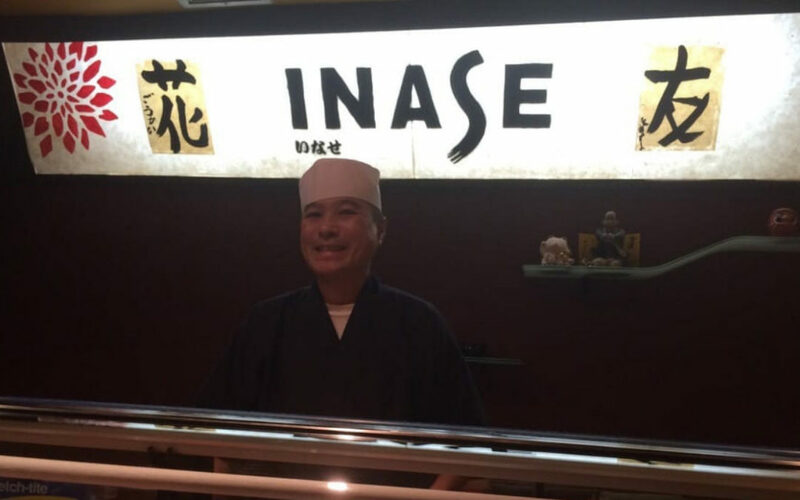 Wami-san, Inase, was surprisingly great! 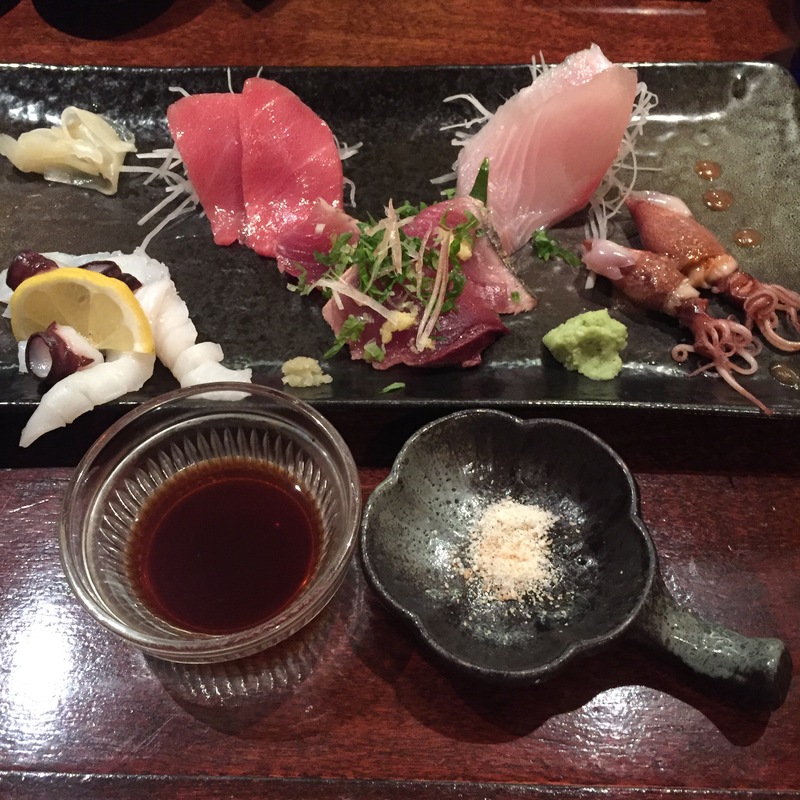 The variety was good enough, but the fish was incredibly fresh, and the preparations were spot on. I had not one bad or even mediocre servings, but EIGHT great servings. Eight! In my rankings, this is incredibly rare, practically silver unicorn status! Value – Even crazier part! 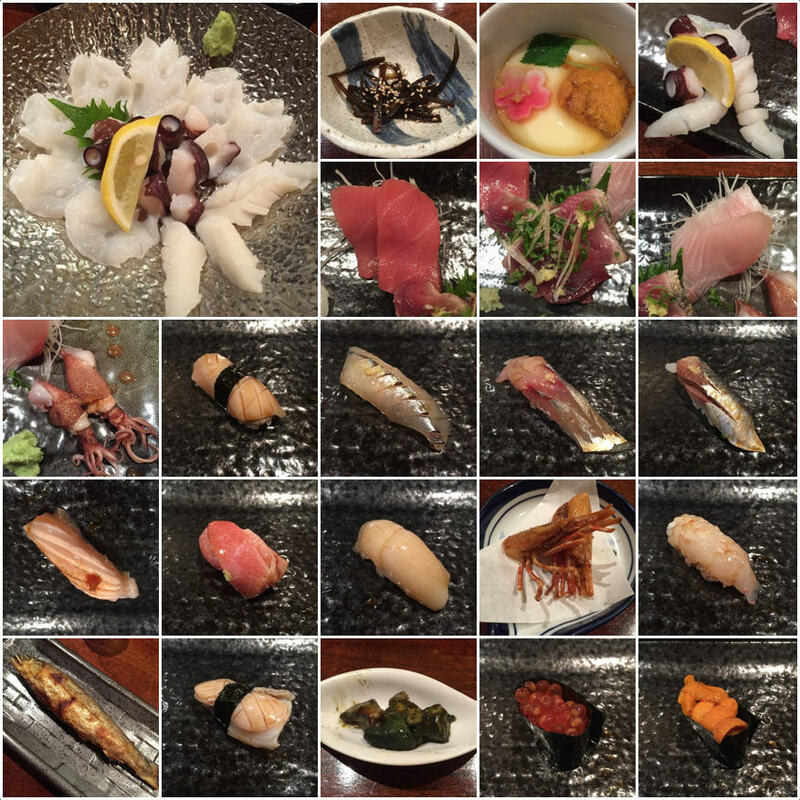 Per the menu, Inase offers some odd-ball $60/$80/$100 options for omakase, with no indication of how many pieces per option. As usual, we pick the largest of the options, but bill still came to $110 BEFORE the add-ons. Per piece cost? Below $7! That’s great! 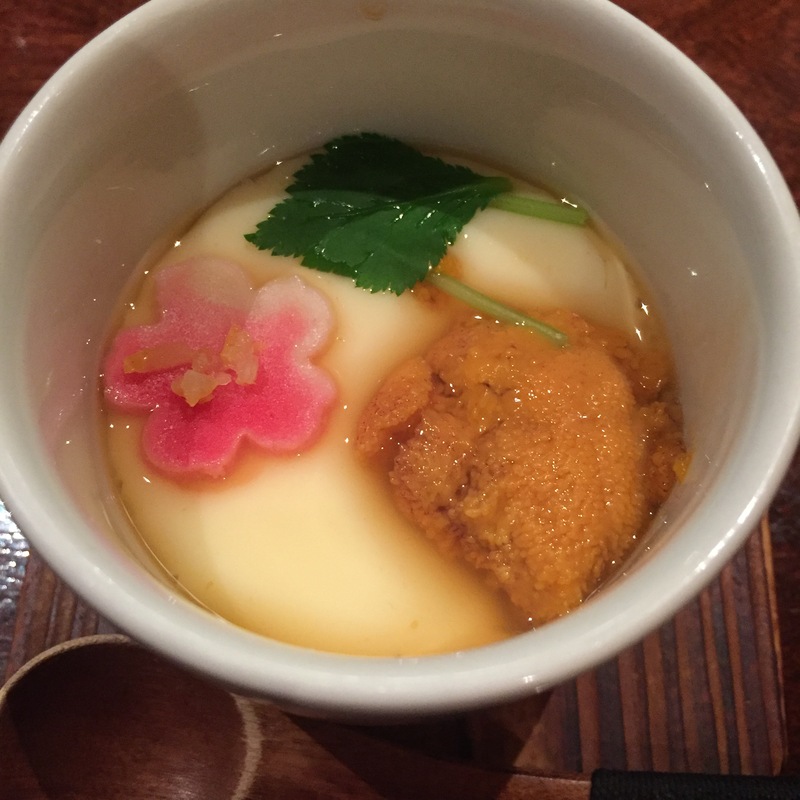 CHAWAN MUSHI – The UNI was decent! Bites with the UNI, this was a decent dish, bites without BLAND. 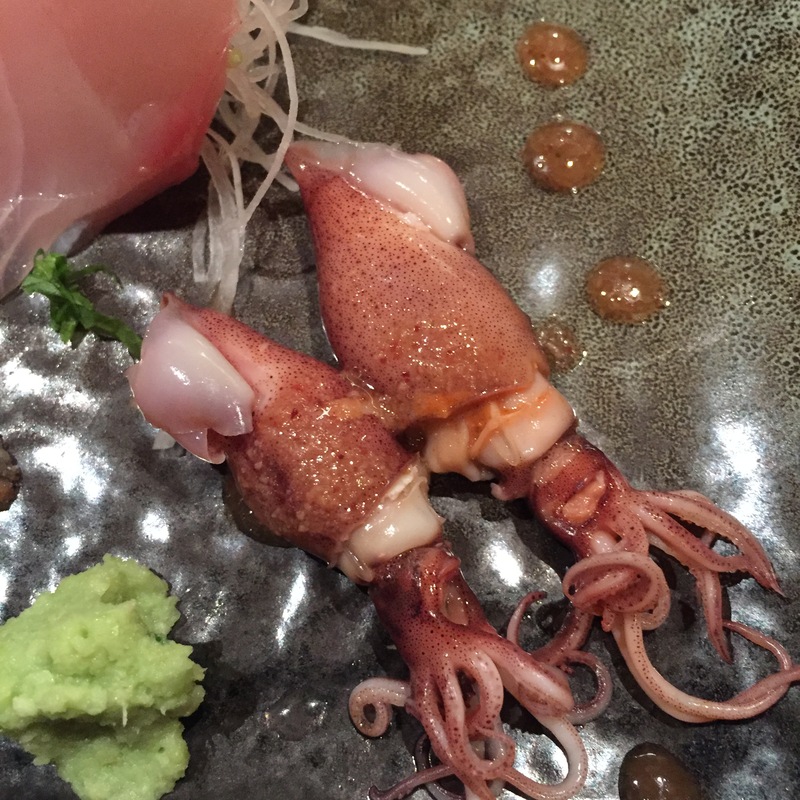 NAMADAKO (Live Octopus) – I tried a number of different angles when taking this photo. I don’t know why it looks so dry, but it wasn’t. It was very, very good NAMADAKO. 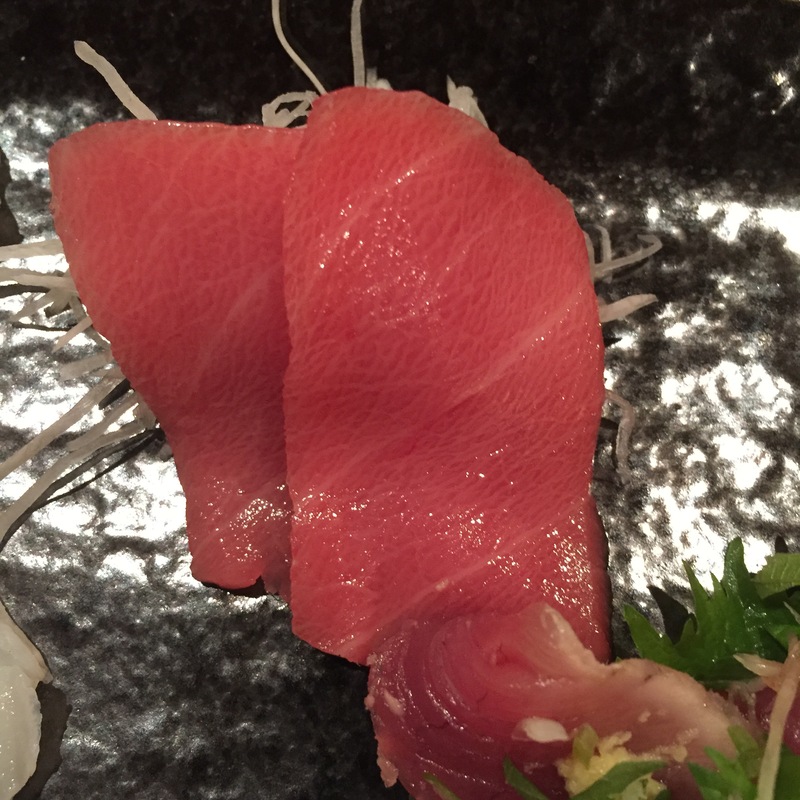 CHUTORO (Medium Fatty Tuna) – Great flavor, and no funky aftertaste. The vein was a bit much though, a bit too chewy. 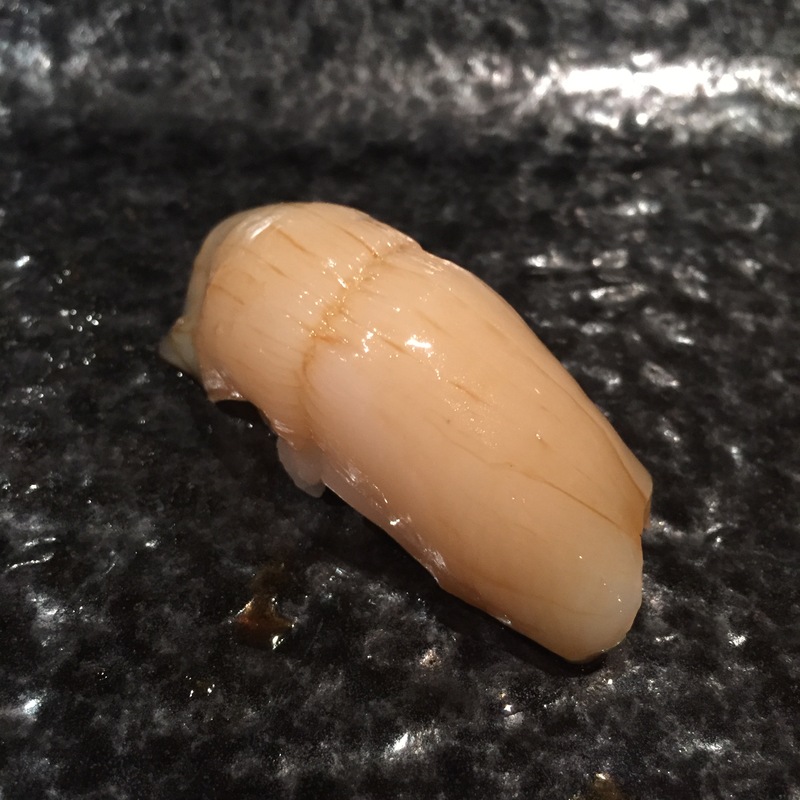 HOTARU IKA (Firefly Squid) – This is a bit unfair for INASE… we have been having a great streak of HOTARU IKA from Katsuei, from Jewel, and others. 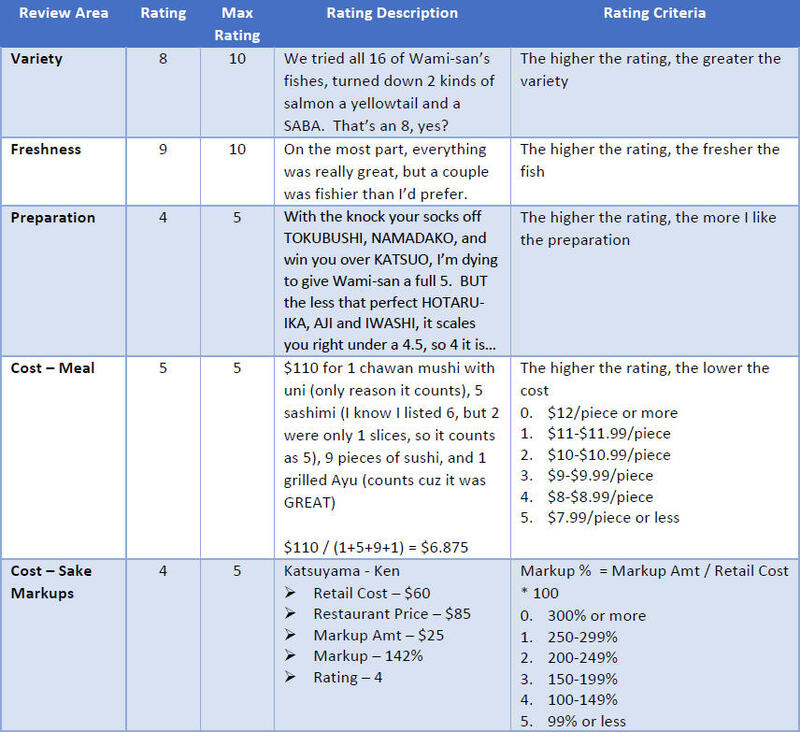 INASE’s HOTARU IKA was great, only fall back was the dressing. It was like a miso ginger dressing rather than a sweet miso sauce. Not loving the dressing. 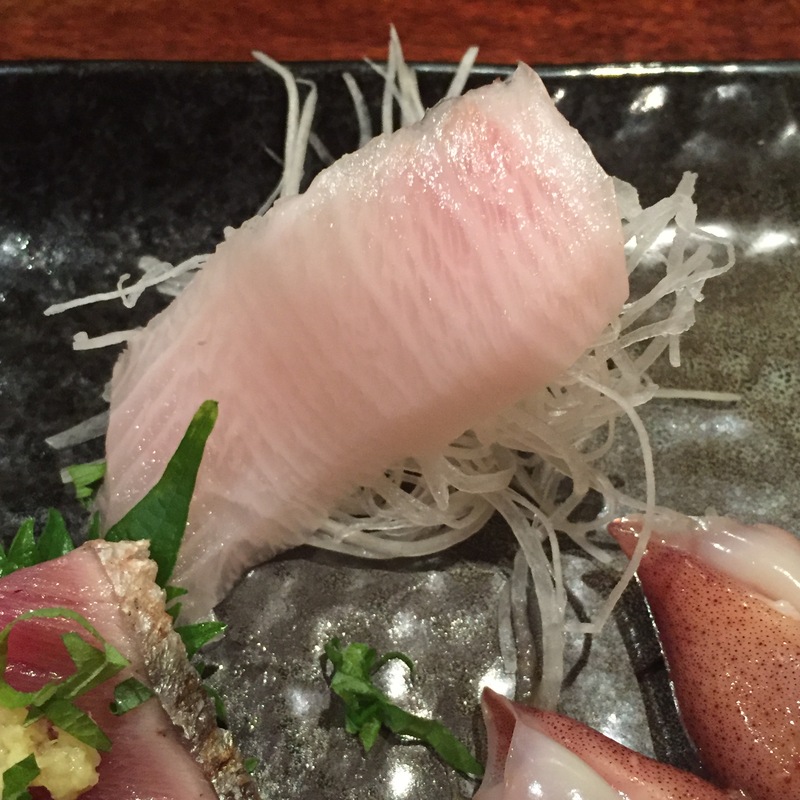 KANPACHI (Amberjack) – The presentation/stacking of this was very peculiar. 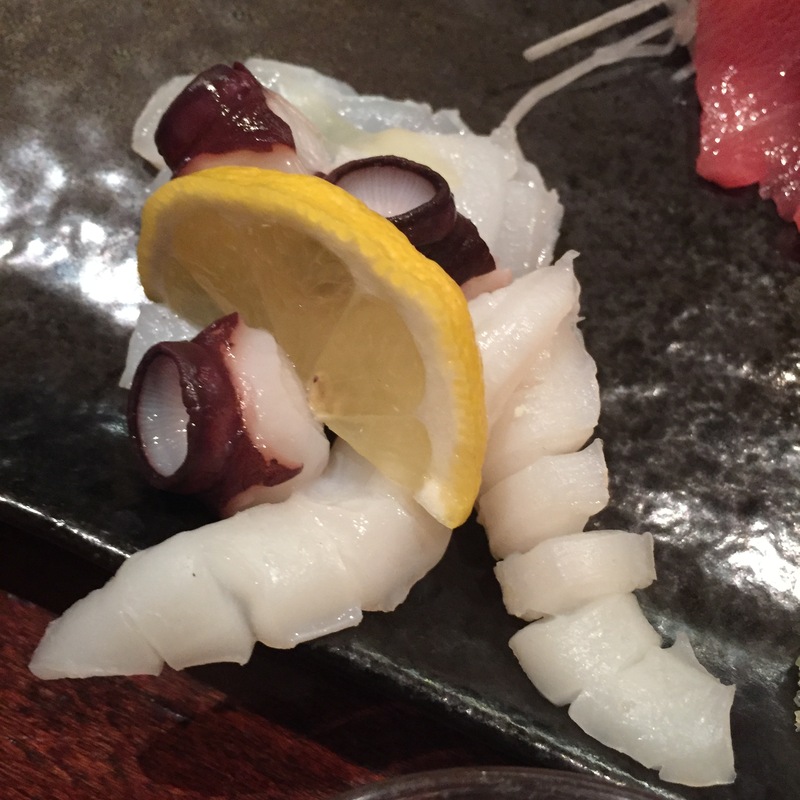 This front piece is the KANPACHI, while the one in the back is the HAMACHI-SUNAZURI. The KANAPCHI was great! Very nice crunch! 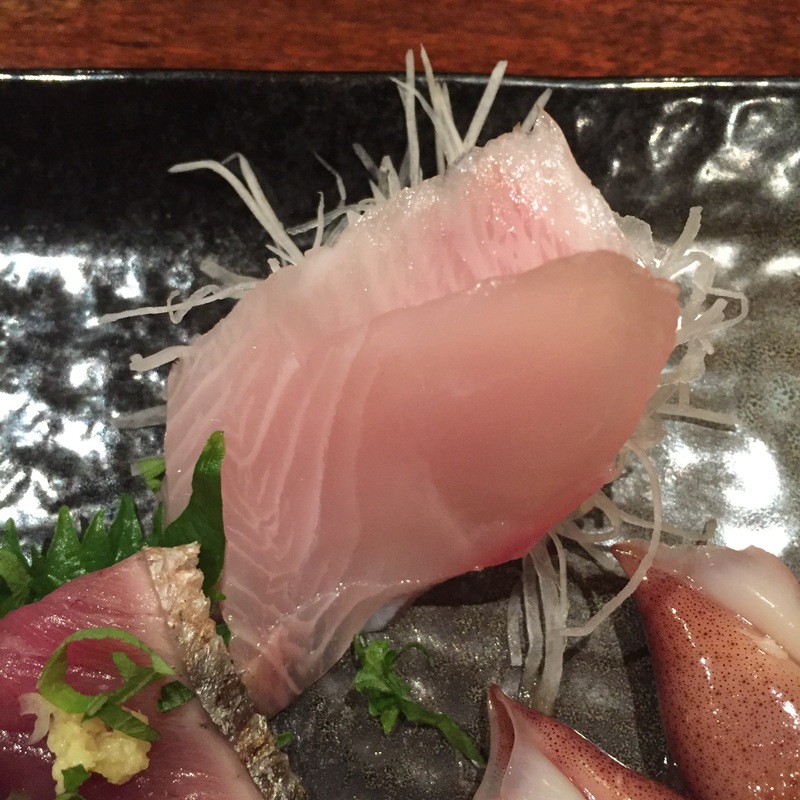 HAMACHI-SUNAZURI (Yellowtail Belly) – The HAMACHI-SUNAZURI was very good as well. I just don’t like the “convenient” yet strategic placement of the costlier, more rare fish in front, and the cheaper, more available fish in the back. I would have preferred them placed side by side. It’s a pity that the placement was such a distraction. They could have been plated side by side, they were both great. 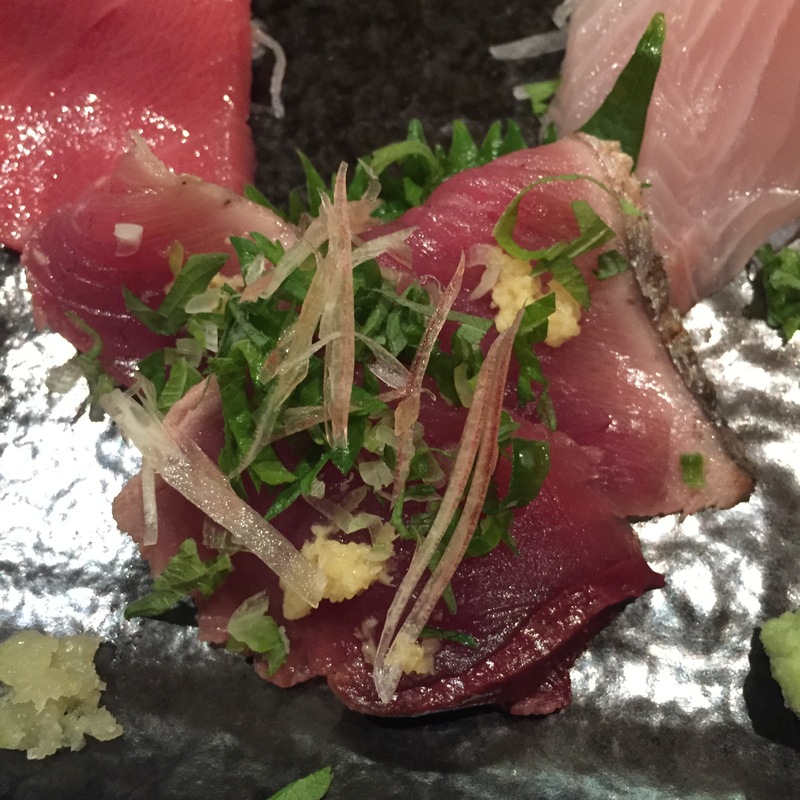 KATSUO (Bonito) – Not a huge fan of KATSUO in general, but this cut was really very good, borderline great. I had one cut completely solo, and the second with all the dressings, the thinly sliced mild Japanese Onion, chopped shiso, and grated ginger. 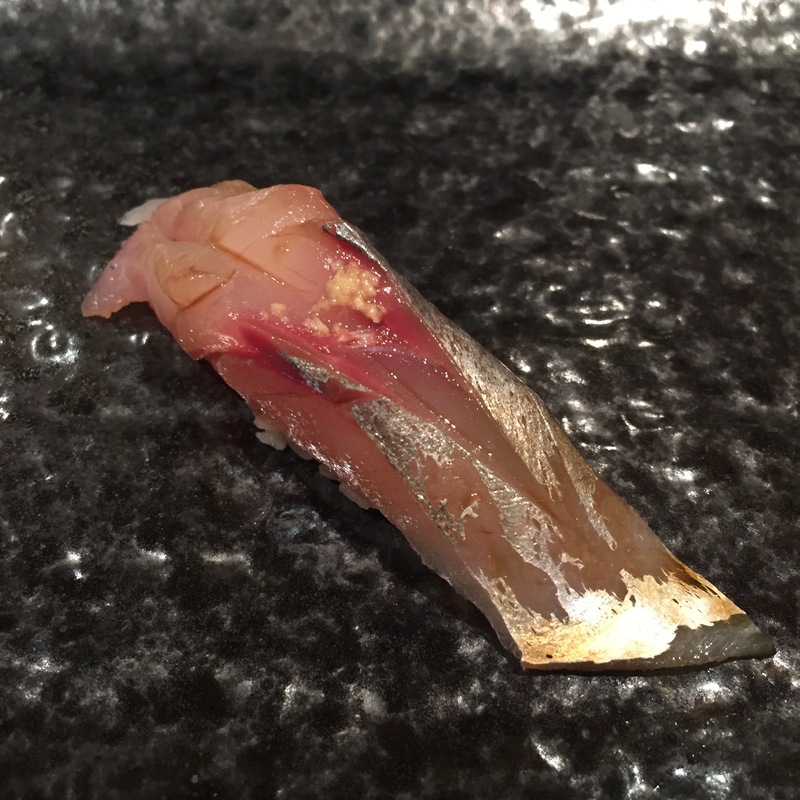 In the bite stripped of all the dressings, you can really taste the intense-natural KATSUO flavors. Really great. In the bite with all the dressings, you can see how all the dressings really did bring out the flavors even more. Nicely done! SAYORI (Needle Fish) – Served with a tiny cut of shiso between the fish and the rice, and a small dab of grated ginger atop, this serving was very, very good. 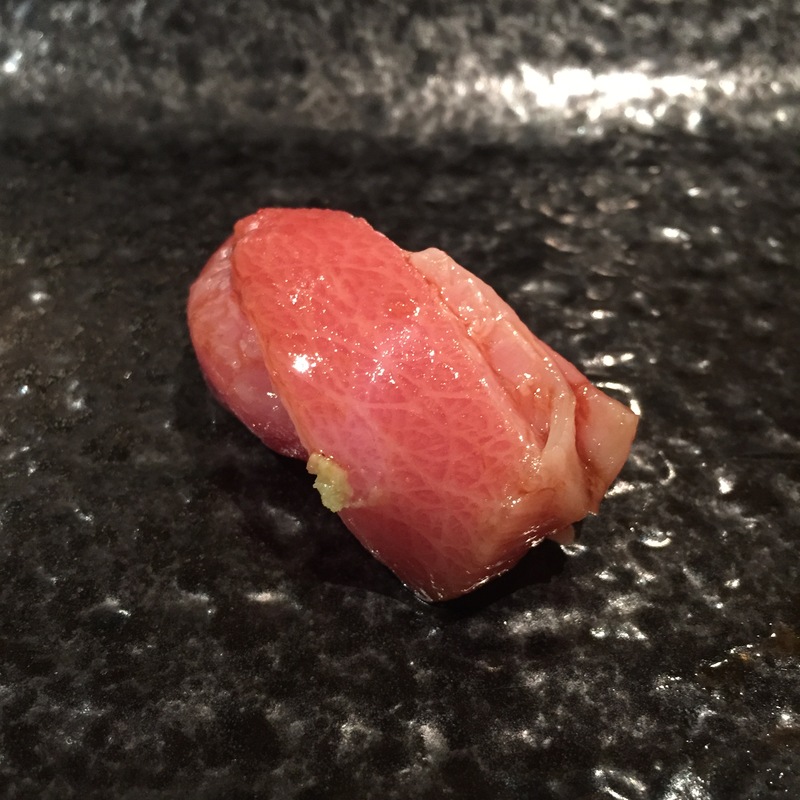 OTORO (super fatty Tuna) – Sliced like Ichimuru-san’s! 2 thin slices stacked atop each other, and dressed with a tiny dab of grated ginger. This cut from Chile was a bit chewy, but so buttery, so incredible. Zero aftertaste! 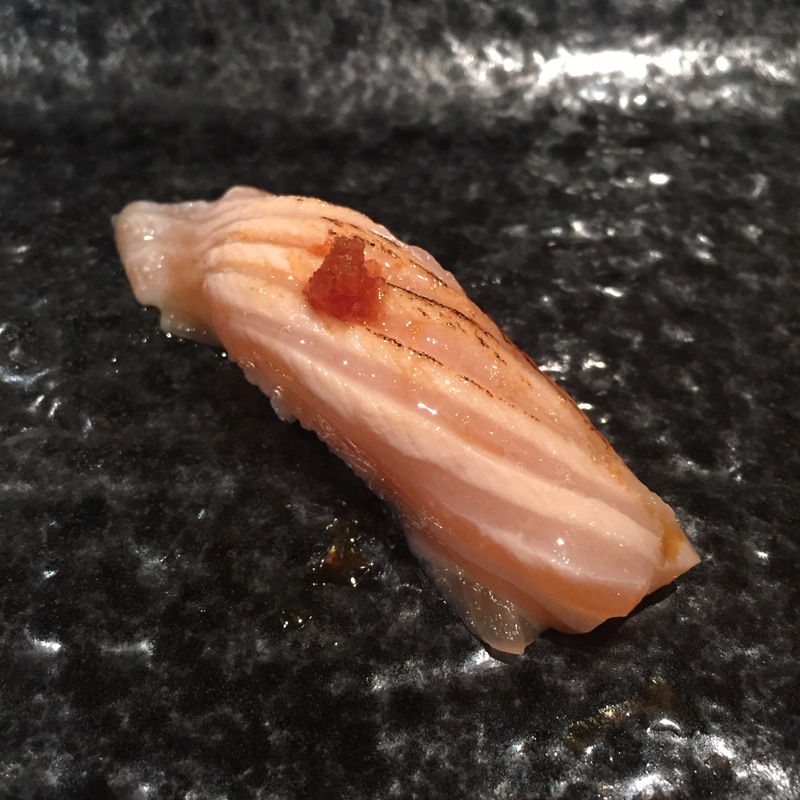 Salmon Belly – Seared salmon belly topped with MOMIJI OROSHI (Grated Daikon Radish marinated with red chili pepper). 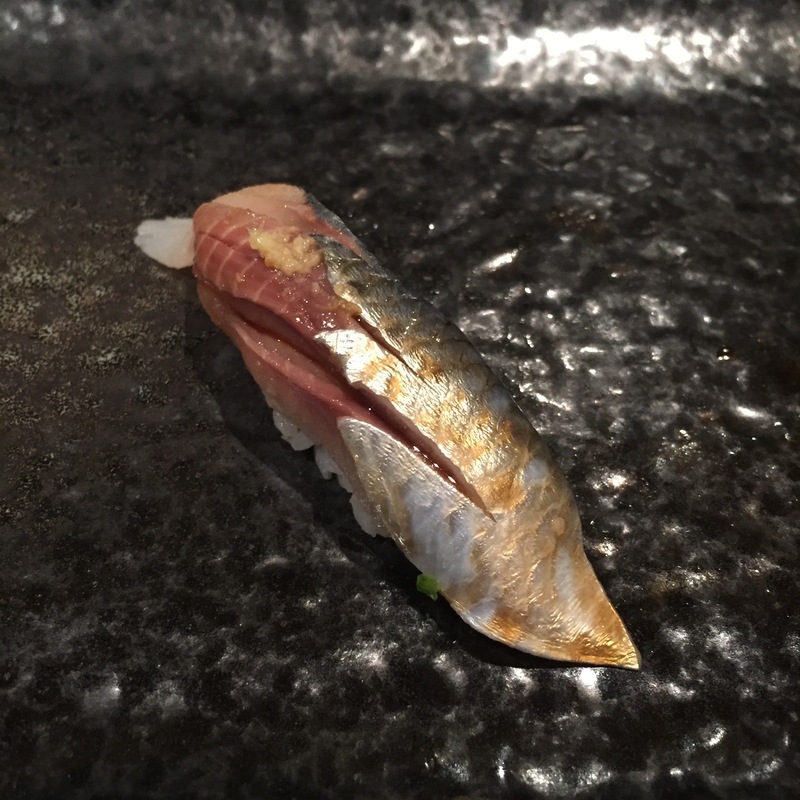 Good – but if you’ve been reading my posts, not a huge fan of salmons in my omakase. Very good though! 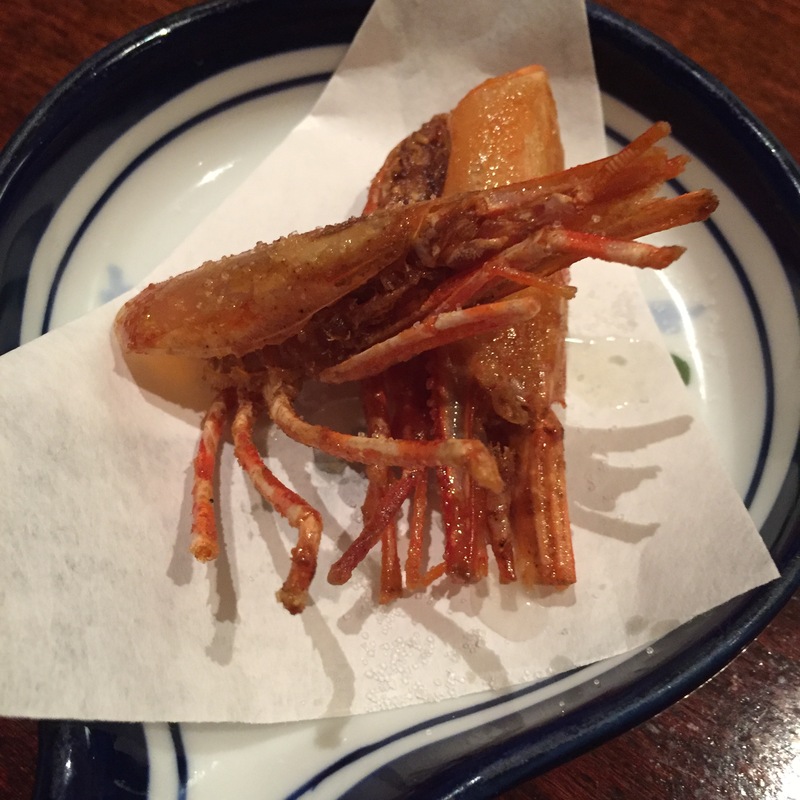 BOTAN EBI (Sweet shrimp) – Oh no… Topped with a tiny bit of citrus and soy, this was very good. Too bad this was the second shellfish serving with zero crunch. Look! We got our fried shrimp head! 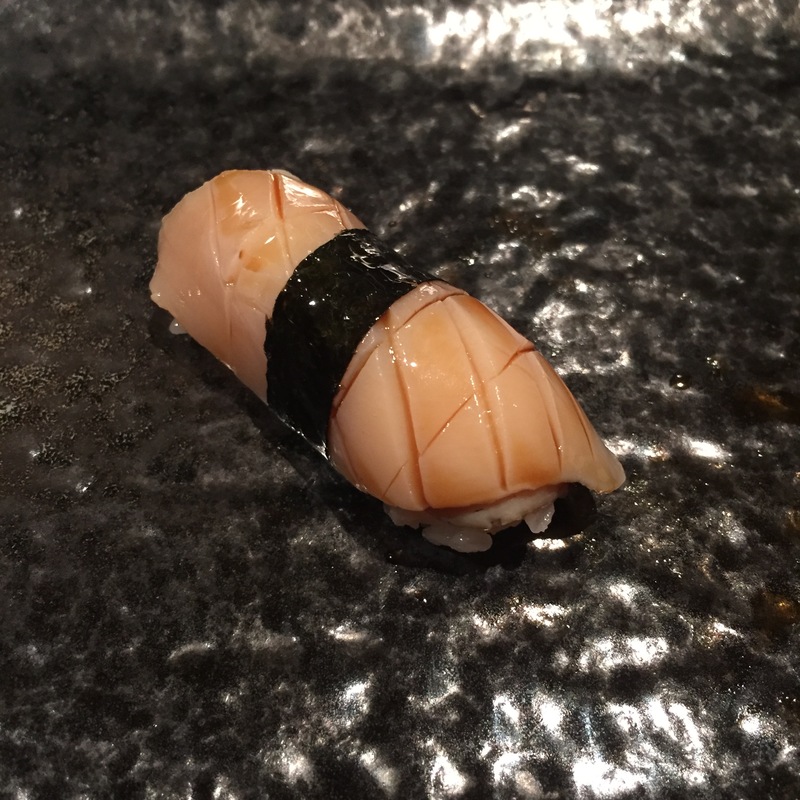 TOKUBUSHI (Abalone) – Star of the night!!! 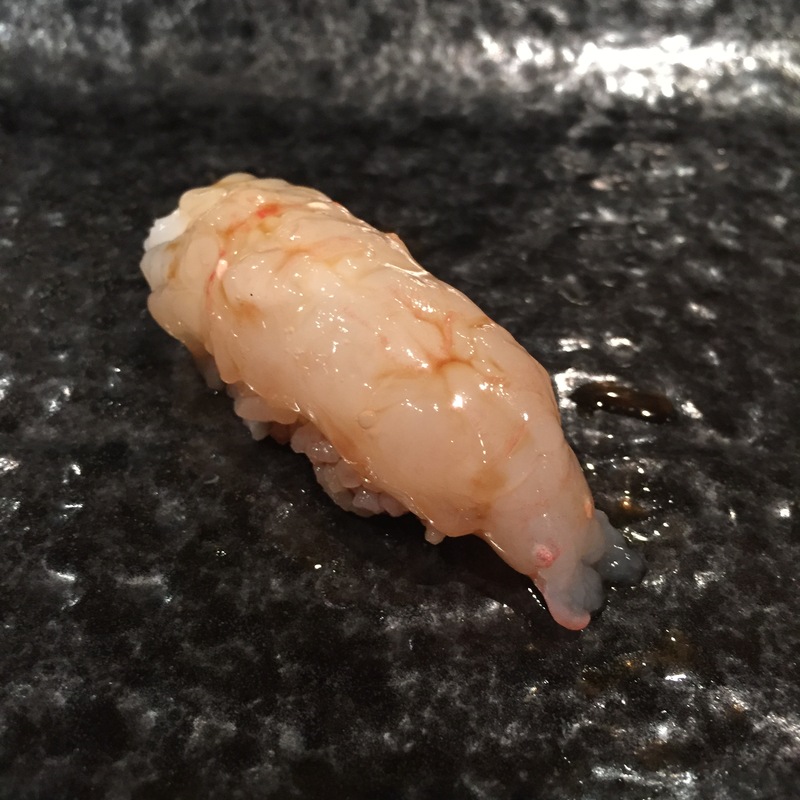 Unlike most sushi-yas, Wami-san served his TOKUBUSHI raw, and not braised. It was also topped simply with a tiny bit of soy, rather than the eel sauce which completely overwhelms the fish. Wami-san also provided us the TOKUBUSHI guts! So incredibly happy! 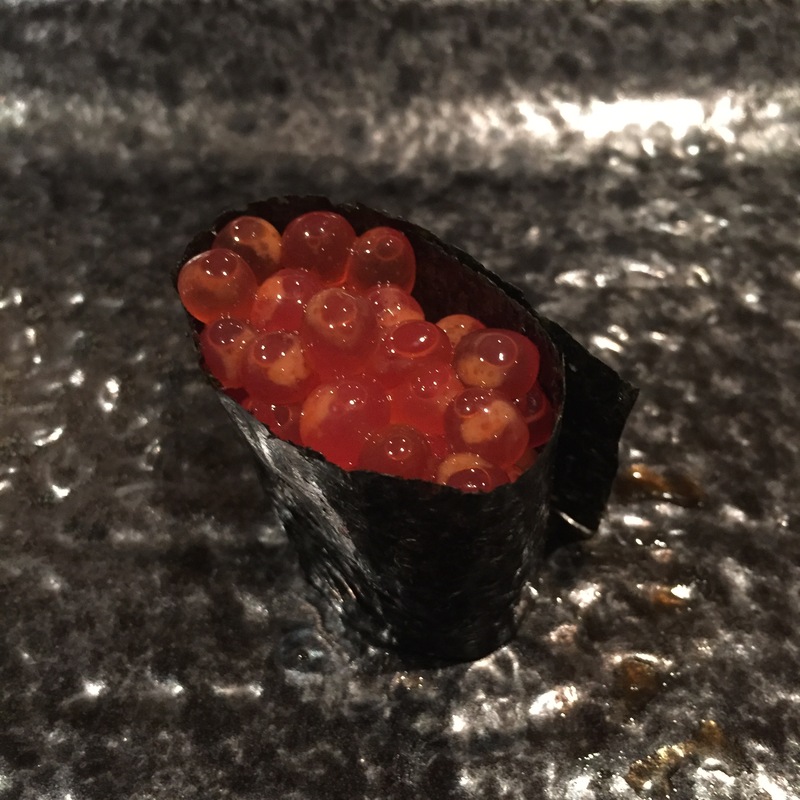 IKURA (Salmon Roe) – Look how big, round, and plump these pearls are! Pops beautifully when bitten. Really, really great. 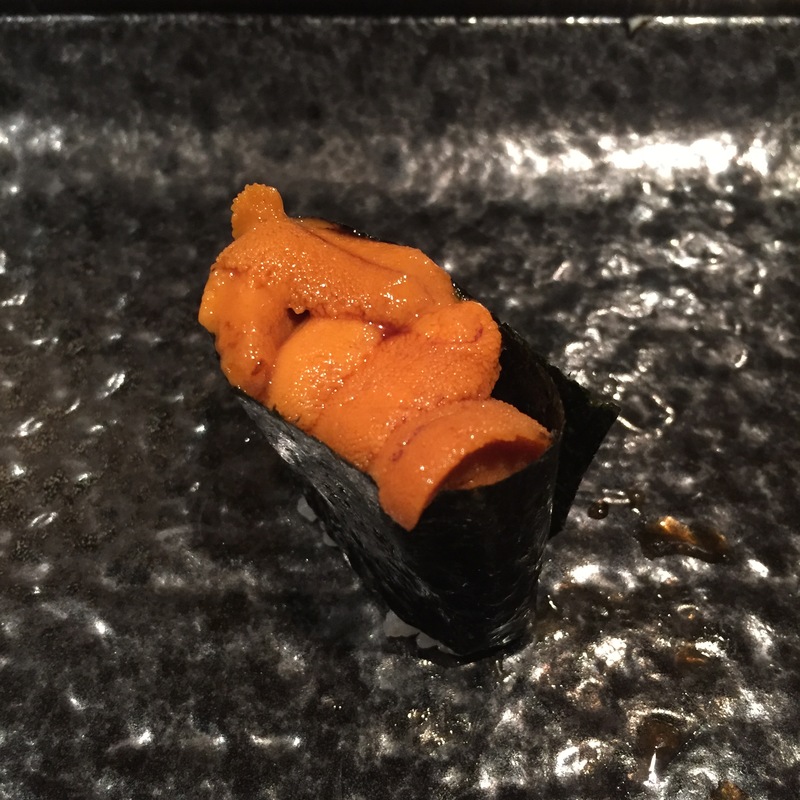 HOKKAIDO UNI (Sea Urchin) – Not outrageously sweet and nutty like the usual HOKKAIDO UNIs, but still perfectly respectable! 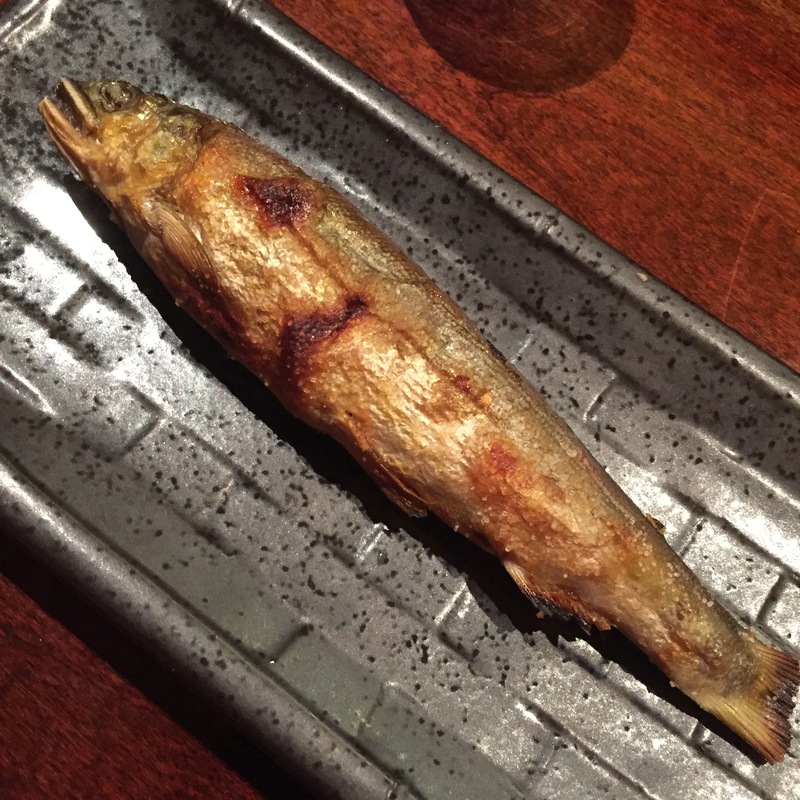 AYU (Japanese smelt) – Served grilled, not fried, so wouldn’t have that crunch. But the flavors of a grilled smelt. OMG – so, so great! 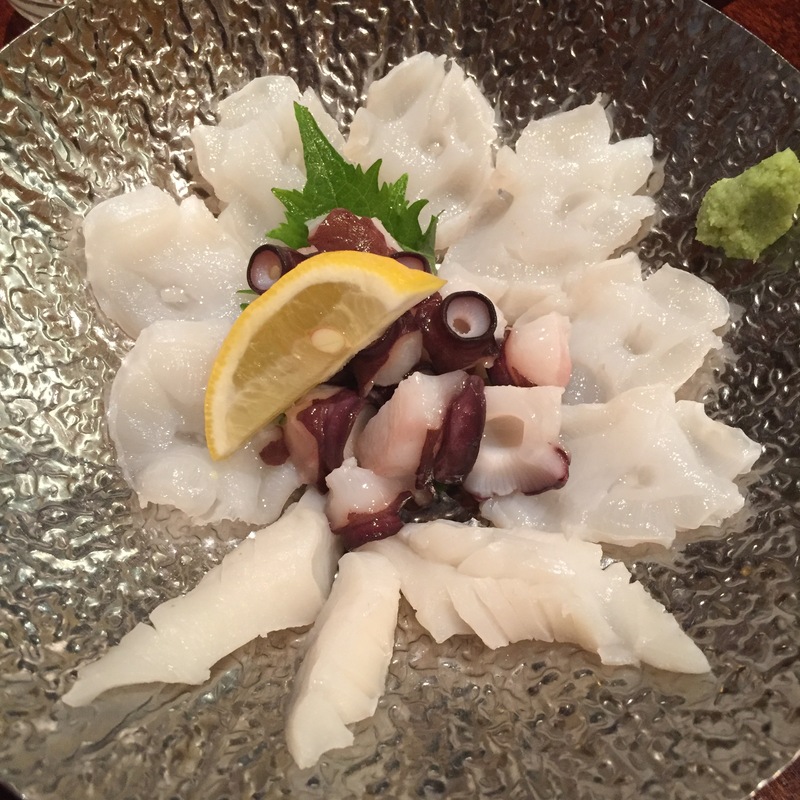 NAMADAKO (Live Octopus) – We ordered a repeat of the NAMADAKO thinking it was going to be the sashimi portion size, but this plate was GINORMOUS! It was so great that I would normally be thrilled. Only drawback is we had no space left for anything else! 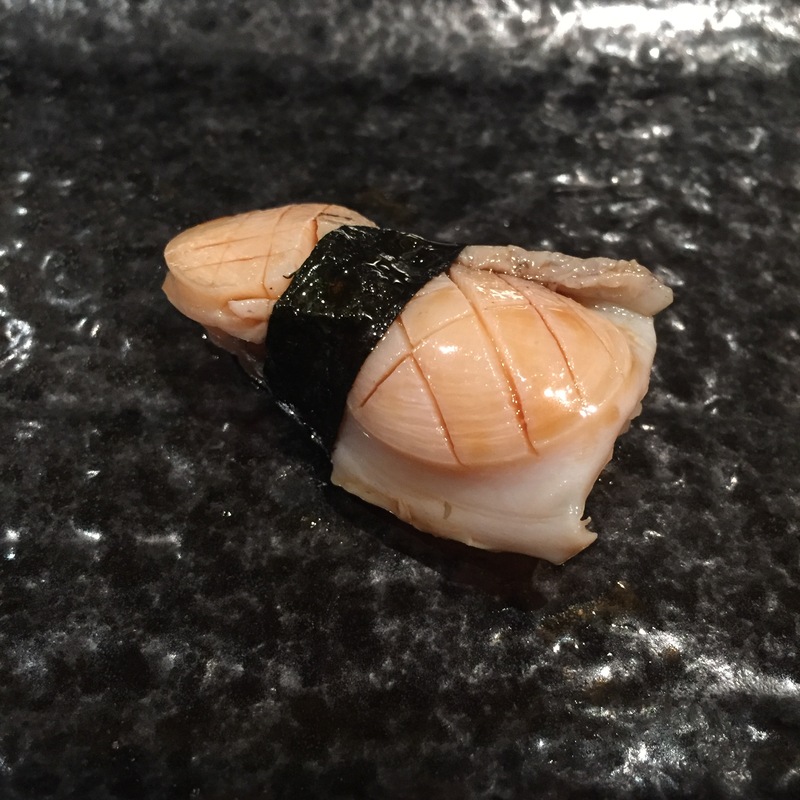 TOKUBUSHI (Abalone) – If it hadn’t been the ginormous NAMADAKO, we would have ordered 3 more TOKUBUSHIs. Just as delicious as the initial serving! 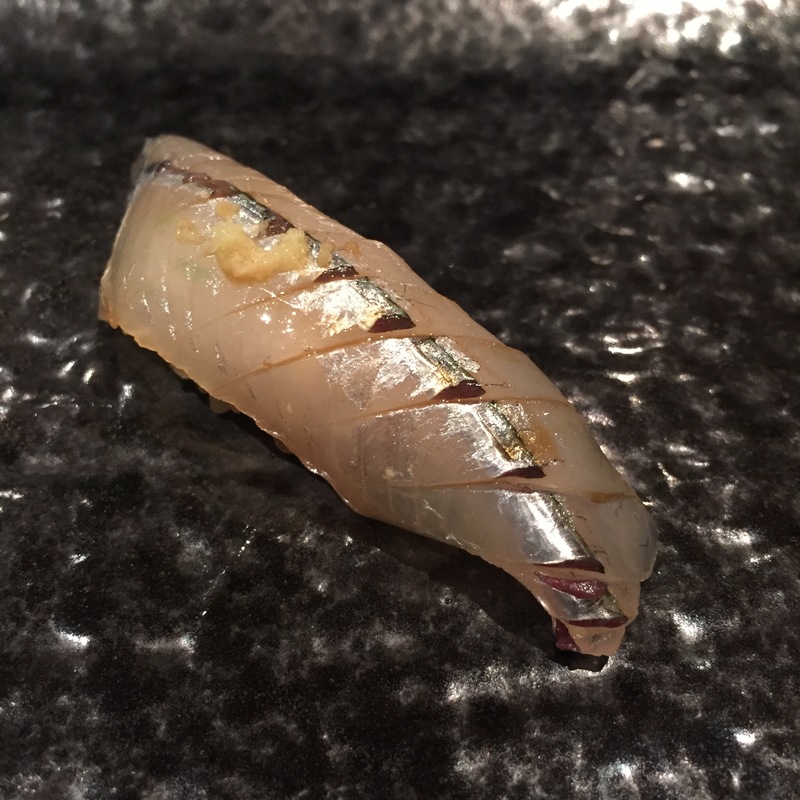 IWASHI (Japanese Sardine) – Marinated a bit too long, yielding the fish to be a bit too salty, and a bit too fishy. Still very good though!